This wine is sure to make a statement everywhere. Time in the glass uncovers notes of candied orange, cardamom, clove and dark olives, leading to an intense palate that shines with graphite and cassis. 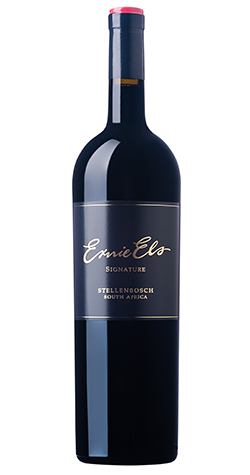 Perhaps the most serious Ernie Els Signature yet, the 2011 is a brooding, powerfu Bordeaux-style blend produced from prime vineyards in the Helderberg appellation of Stellenbosch. Predominantly Cabernet Sauvignon, the purple edge and pitch black core immediately points to its unwavering nature and shadowing depth. Time in the glass uncovers notes of candied orange, cardamom, clove and dark olives, leading to an intense palate that shines with graphite and cassis. It has a towering structure built on a foundation of crunchy tannins and pure fruit, all solidified by fine yet spicy oak. Long and rewarding, the tail finally ends with a touch of salted liquorice. This is best cellared for 5 to 10 years as the heady tannins integrate further. The Hutton Clovelly soils contain a high gravel content which offers rich middle palate weight giving this wine exceptional depth and fruit purity. Each variety is separately managed to create unique and varied flavour profiles for this classic, ‘Medoc-style’, Bordeaux blend. With an altitude of approximately 250 metres above sea level together with the cooling influence of the Atlantic Ocean just 15 kilometres away, this extends the ripening period by up to 3 weeks resulting in lovely phenolic ripeness. Grape bunches were gently destalked with a Bucher de-stalker and lightly crushed. Fermentation took place in 7-ton, open-top stainless steel tanks with yeast WE 372 being added to the juice. The wines were pumped-over and punched-down manually 5 times per day ensuring maximum colour extraction from the skins. After primary fermentation the maceration period was 10 - 16 days before pressing. Each variety is maturated separately (micro-vinified) in oak barrels before blending and eventual bottling. From Anonymous of fort lauderdale , Florida on 7/13/2018 . From Platter&#39;s of San Francisco, California on 8/12/2015 .